You probably know the story of Schrodinger's Cat. Essentially, you put a cat in a box and seal it up. The cat is neither alive nor dead (or BOTH alive AND dead, depending on what your brain can handle) until you open the box. Then, the cat is alive or dead BECAUSE you opened the box. You caused the cat to live or die, because you opened the box (forget the part about sealing up the box maybe causing the cat's death...that's irrelevant...). 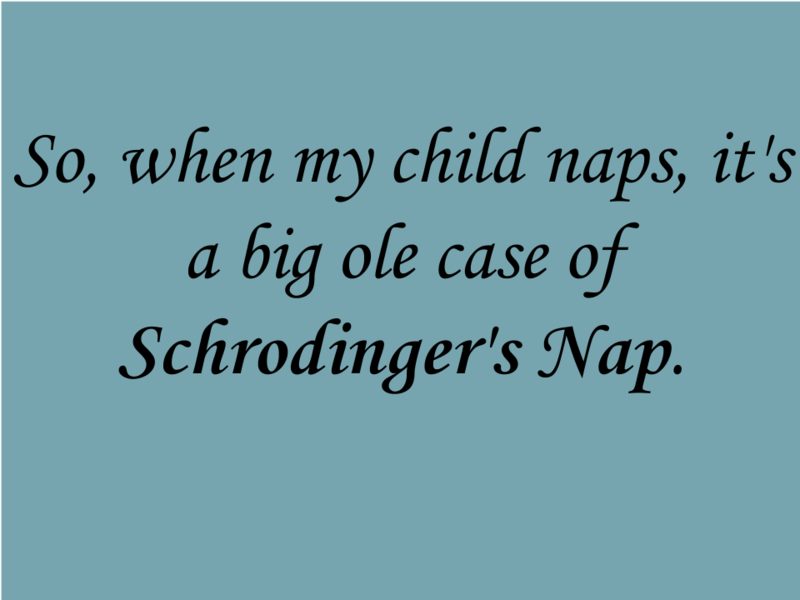 So, when my child naps, it's a big ole case of Schrodinger's Nap. When I leave the room, he is both napping and not napping. For my own sanity, I can safely assume that he is napping until I click on the security camera to find out. When I see him rolling all over the place, flinging his stuffed shark around the room, well, he's not napping, and it's my fault, because I opened the box, and now I have to go back in there, tuck him back in, and sing some more. Today, I sang to him while his sister (thankfully) played on her mat, cooing and ringing the rattle inside the lion. He wiggled and fussed, finally giving in when I suggested that a refusal to nap would result in the absence of playtime later (I totally worded it that way, because, you know, my three-year-old just gets it). I returned to the living room, home of the computer with access to the feed from the aforementioned security camera. I clicked over one time. Still napping. Sister got a fresh diaper change and happily returned to kicking and cooing, because who heard of two children napping at the same time? (For the record, I have heard that this unicorn of child behaviors actually exists in some households, but the eight-week-old hasn't gotten on that wagon just yet). And now it's on to a little something known as "Me Time" (well, sort of, because I'm also cooing at and talking to the baby, and when she's ready to nurse, it's back to what's known as "The Other 23.5 hours of the day"). 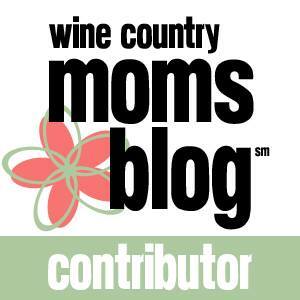 AND, OH MY HELL, WHO IS RINGING MY DOORBELL? AND KNOCKING? YOU REALLY NEED TO KNOCK, TOO? THIS BETTER BE A BIIIIIG EMERGENCY. Nope, just the mail delivery by our regular mail person who knows we have two small kids. Come on! Nope. Not going to look. If I don't look, he's still sleeping. And besides, in like an hour, he's going to appear in the living room, and then I'll have my answer. 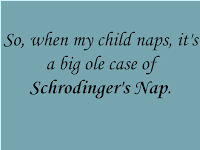 Because, unlike Schrodinger's Cat, the mystery of Schrodinger's Nap is not a box that shall forever remain unopened. No, I get to experience this great philosophical brain bender Every. Single. Day.